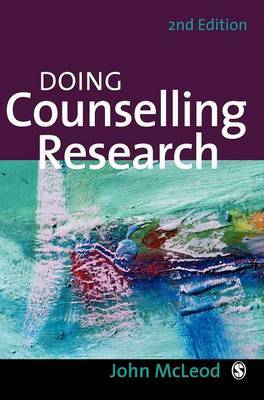 'This is a great starting point for anyone studying or interested in counselling research. I would thoroughly recommend the Second Edition of this book' - Terry Hanley, "Healthcare Counselling and Psychotherapy Journal". "Doing Counselling Research, Second Edition" is a practical and accessible introduction to the research process within counselling and psychotherapy. Written both as a guide to carrying out research, and to using existing findings to inform practice, it provides essential information for all trainees and practitioners.John McLeod guides the reader through the principles and practice of undertaking a successful research project, explaining how to: review the literature; select appropriate methods (qualitative and quantitative); collect data; design and implement an effective study plan; and, evaluate findings. Taking account of developments in research methods, the book has been fully revised and updated and includes new chapters on evidence-based practice and practitioner research. Research literacy is now within the skillset of all counsellors and psychotherapists and, as a practical introduction to the subject, "Doing Counselling Research" will be indispensable to trainees and practitioners alike.